Operator West Midlands Trains (WMT) has signed a contract with Vivarail for the supply of three upgraded Class 230 units in the UK. An announcement revealing the two parties had struck a deal was initially made in March. 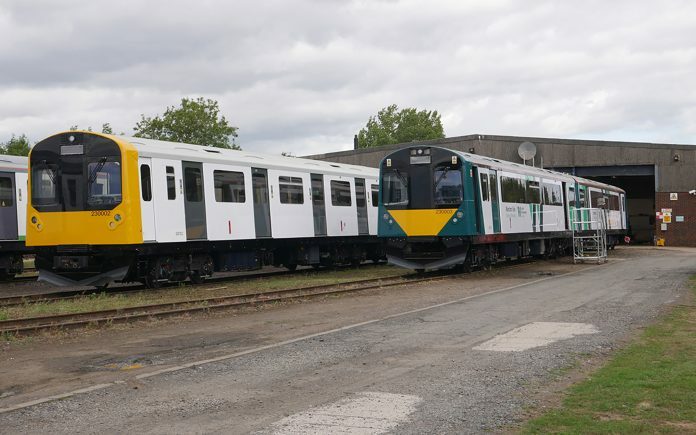 The two-car trains, which are converted London Underground D78 Stock, will be used on London Northwestern Railway services between Bedford and Bletchley from December following an extensive overhaul at Vivarail’s Long Marston depot, Warwickshire. Vivarail CEO Adrian Shooter said: “Everyone is pleased with the look and build quality and I’m very proud of the work my team has done. “I am particularly impressed with the London Northwestern Railway livery and their interior designs – they certainly showcase the Class 230 and I think will be well received by Marston Vale’s passengers. The trains will be supplied as diesel units, with the capability to convert to battery units in the future. They will include universal access toilets, USB sockets and modern ‘airline’ seating. The Class 230 units will be maintained at the Bletchley train maintenance depot. These should enter service in December and to replace the Class 153/Class 156 and Class 150 used on the Marston Vale Line to be cascaded to operate elsewhere on West Midlands Trains or cascade the units to Northern or Great Western Railway. Or cascade the Class 150’s to GWR and the Class 153/156 to Northern or ScotRail. Also WM Trains could also possibly order few more to use the Class 230 DEMUs on Coventry-Leamington Spa and Coventry-Nuneaton. These are great trains already, so why ruin them by stuffing airline seasts into them? Passengers hate them. I hope this experiment succeeds. Although rail vehicles may last 30 to 40 years, each carriage can cost 7 to 10 times the cost of a road vehicle of equivalent seating capacity, which is a disincentive to investment. It is also environmentally friendly to continue to use old trains, rather than making new ones – so long as their energy consumption is reasonable. I rode in a battery powered class 230 at RAIL LIVE this year, and was impressed.